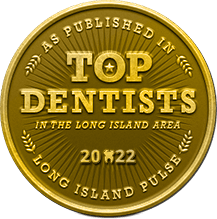 How Much Do Long Island Dental Implants Really Cost? When it comes to your options in tooth replacement, dental implants are by far the best choice you can make. Yes, they may come at a higher initial cost than other options — and the final price tag depends on how many teeth you’re missing, and where. 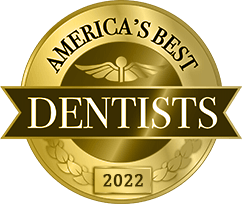 But no matter what they cost, Long Island dental implants are the only solution that promotes your oral and overall health for a lifetime to come. 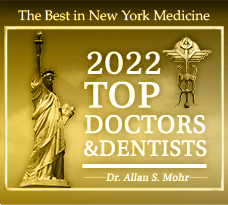 Keep reading to learn the top three reasons dental implants from Dr. Allan S. Mohr are a wise investment, then schedule an appointment to find out if you’re a candidate for implant dentistry today! Ask anyone who has a loose or ill-fitting denture and they’ll tell you that there’s not much that’s worse than the stress of an insecure tooth replacement. Dental implants placed by Dr. Mohr will never slip around or fall out, because they closely mimic your natural tooth structure. They are a stable, secure tooth replacement option that allows patients to eat, speak, and smile with full confidence. Dental implants will never rub painful sores in your soft tissues, either. Patients who choose dental implants as soon as they lose teeth enjoy a higher quality of life over time. Implant dentistry is especially beneficial for younger patients. Our bones need stimulation from plenty of blood flow to thrive. When one or more of your teeth go missing, your jawbone will gradually diminish as it senses it is not being used and sends nutrients elsewhere. That’s where the sunken look we associate with tooth loss and older age comes from. But because titanium dental implants can fuse with your jawbone, they sort of trick your body into thinking you still have a natural tooth, which prevents the slow degradation of the jawbone. What’s more, patients with dental implants enjoy a stronger, healthier mouth with teeth that can support a varied, nutritious diet. 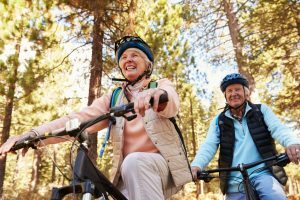 Dental implants do come at a higher initial cost than non-implant retained options in tooth replacement (like a traditional denture or fixed bridge), but Dr. Mohr encourages patients to consider the fact that dental implants stay strong for a lifetime. Dentures, on the other hand, will need to be replaced, relined, or refitted periodically to keep up with the slowly degenerating jaw. A fixed bridge will last for decades, but eventually will require repair or replacement. Compare that to dental implants which, with proper care and steady overall health, can be expected to stay stable for the rest of your life, and you’ll see that it’s worth the higher cost upfront for a long lasting smile replacement. 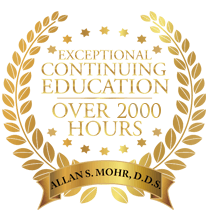 Dr. Mohr and his team urges patients to look beyond the cost of dental implants and to consider the wealth of benefits the comprehensive tooth replacement offers. If your tooth loss is recent, or if you are on the brink of losing one or more teeth, you are likely an excellent candidate for dental implants. Don’t wait to get started on your tooth replacement. Contact Dr. Mohr’s office and request an appointment to begin discussing your eligibility for the procedure today! by: allanmohr at April 25, 2017 . Comments Off on How Much Do Long Island Dental Implants Really Cost?